Everest Poker is not recommended. 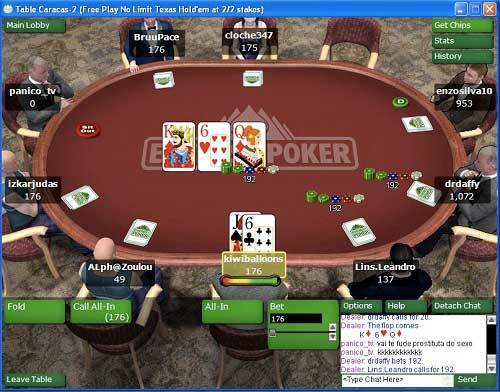 Instead, we suggest bet365, one of the top global online poker rooms. They offer a new player bonus up to €100. All links will redirect to bet365. Everest Poker, the only skin of the Grand Virtual Network, is a must stop for poker enthusiasts. Their line up of promotions, great sign up bonus, and great gaming software ranks them among the best. The installation software automatically downloads the remaining necessary files and installs them – there is no set-up wizard in which you need to keep clicking the next button. On a cable conection, I had the software downloaded in less than a minute. Once the software is installed, you will need to set up an account with Everest. Simply click the “Join Now” button where you will be taken to a registration page. You will need to select a username, verify your email, and agree with their terms and conditions. 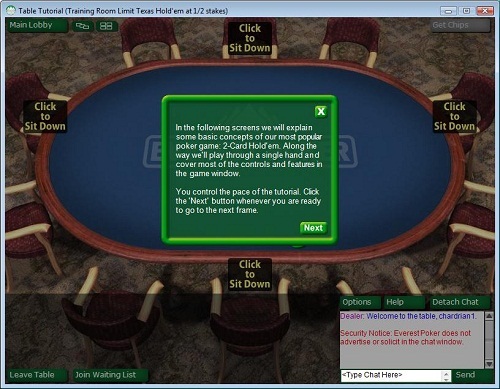 Before you get started playing, you can run through Everest Poker’s Poker Tutorial, which will give you step-by-step instructions for playing Texas Holdem. To use the Poker Tutorial click on the help button on the bottom of the lobby and then select poker tutorial from the drop down list. Then test out your skills in the Training Room where you play against automated trainers before you take your game out to the real digital felt. The software itself is quite slick. The table graphics are 3-dimensional, backgrounds are nice, and overall the software is impressive looking. The lobby allows you to quickly seat yourself at a table using the “Quick Seat” lobby or allows you to choose the exact table you prefer using the “All Games” button. The tables are also completely resizable so you have a lot of flexibility for multi-tabling. These graphics and features come at a price, though. The memory requirements are pretty substantial, and can slow down your machine. The Everest Poker client offers some other cool features. You can check your hand rank at any time by hovering your mouse/cursor over your pocket cards to see the best rank of your hand. This can be helpful if you’re multi-tabling a bunch of tables and need to quickly identify your hands. Another good feature that helps with multi-tabling is reviewing the previous hand. It’s easy to miss the results of a significant hand on one table if our attention is focused on another. Everest allows you to view the results of the previous hand (who won, how much, what cards, etc.) in the upper right corner of the game window. Click on the History button to see how the hand played out. 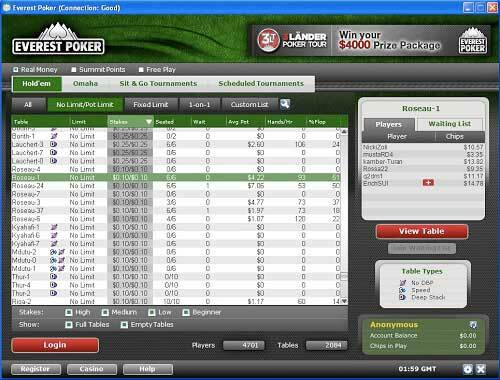 Overall, the software is solid and makes for a great poker playing experience!